Reconstruction of Prototaxites by Richard Bizley, used with permission. Richard Bizley has been kind enough to allow me to reproduce the above painting, which he produced in response to the discussion arising from an earlier post at this site. 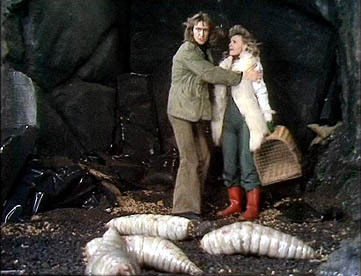 It shows a 'forest' (for want of a better word) of the enigmatic Silurian-Devonian organism Prototaxites reconstructed as a giant fungus. Richard has asked if anyone has any comments to make on the final product. Is this environment plausible? Could Prototaxites have grown in clusters like this, or would nutrient restrictions been such as to prevent such large organisms from persisting in close proximity to each other? Since I produced my earlier post on the possible re-interpretation of Prototaxites as representing rolled ground-cover mats (Graham et al. 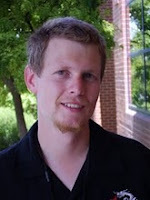 2010a), the proposal has been criticised in print by Boyce and Hotton (2010) and Taylor et al. (2010), and defended by Graham et al. (2010b). Boyce and Hotton regard it as taphonomically implausible that such rolls could form, while Taylor et al. also point out that the major tubes making up Prototaxites are arranged longitudinally down the 'trunk', not radiating outwards. Graham et al. have pointed out how they feel this is not incompatible with their liverwort mat hypothesis. Colour-enhanced cross-section of Prototaxites specimen, from Graham et al. (2010b). Note that the 'growth rings' are not regularly concentric. 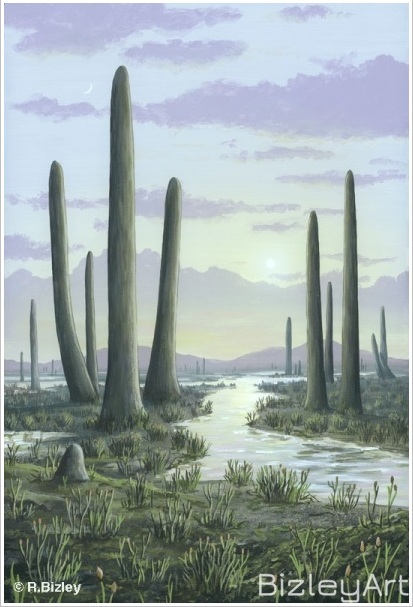 Prototaxites, it should be pointed out, was just one of a number of Silurian-Devonian organisms called nematophytes. Nematophytes are united by their similar internal structure, composed of hypha-like tubes. 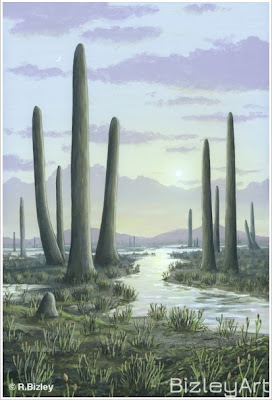 However, other nematophytes did not have the gigantic columnar form of Prototaxites: Nematothallus, for instance, was an encrusting lichen-like form, while Nematasketum fossils are only a couple of centimetres in size. Edwards and Axe (2012) have recently published a study on Nematasketum and supported comparisons between nematophytes and fungi. In particular, they compare Nematasketum to root-like anchoring and foraging structures called rhizomorphs produced by some large modern basidiomycetes. Hillier et al. (2008) nominated Prototaxites as potentially connected to root-like casts found in the Anglo-Welsh Old Red Sandstone, but admitted that the grounds for connection were slight. Boyce, C. K., & C. L. Hotton. 2010. Prototaxites was not a taphonomic artifact. American Journal of Botany 97 (7): 1073. Edwards, D., & L. Axe. 2012. Evidence for a fungal affinity for Nematasketum, a close ally of Prototaxites. Botanical Journal of the Linnean Society 168: 1-18. Graham, L. E., M. E. Cook, D. T. Hanson, K. B. Pigg & J. M. Graham. 2010a. Structural, physiological, and stable carbon isotopic evidence that the enigmatic Paleozoic fossil Prototaxites formed from rolled liverwort mats. American Journal of Botany 97 (2): 268-275. Graham, L. E., M. E. Cook, D. T. Hanson, K. B. Pigg & J. M. Graham. 2010b. Rolled liverwort mats explain major Prototaxites features: response to commentaries. American Journal of Botany 97 (7): 1079-1086. Hillier, R. D., D. Edwards & L. B. Morrissey. 2008. Sedimentological evidence for rooting structures in the Early Devonian Anglo-Welsh Basin (UK), with speculation on their producers. Palaeogeography, Palaeoclimatology, Palaeoecology 270 (3-4): 366-380. Taylor, T. N., E. L. Taylor, A.-L. Decombeix, A. Schwendemann, R. Serbet, I. Escapa & M. Krings. 2010. The enigmatic Devonian fossil Prototaxites is not a rolled-up liverwort mat: comment on the paper by Graham et al. (AJB 97: 268–275). American Journal of Botany 97 (7): 1074-1078.